The name of this soup, as well as the list of healthy ingredients, really caught my eye, especially since I've lost one sister to cancer, with another in remission, and my mother in advanced stages, currently under hospice care. That's half my family, and we ate pretty healthy compared to most families. Internet comments I've read have said this is one very flavorful soup. 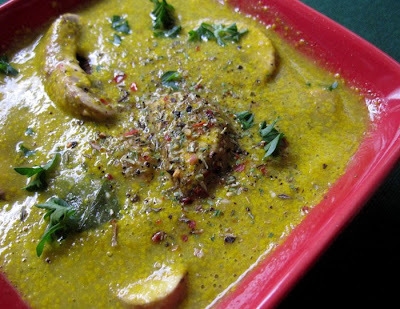 Looking at the photo I found at http://www.wellsphere.com/vegan-article/dr-fuhrman-s-anti-cancer-so..., it looks a bit like blended split pea soup (as split peas are one of the ingredients), although the green is actually from blended cooked greens and zucchini, along with raw cashews. Those are mushroom slices you see floating in the soup. Some comments I've read have suggested replacing part vegetable broth for the carrot juice, as the carrot juice made the soup too sweet. Other comments said the soup was more complicated than most recipes. I was thinking, "Are you kidding? There's no chopping!" Sounds like a very simple soup compared to most I make, and I make lots and lots of soups at my house! This makes a big batch, so you might want to start with a half or quarter recipe for your first try. Unfortunately I couldn't find a way to embed the link to add to the video section here. (This was the only complete video I could find, as everything else is short, incomplete clips.) A more complete recipe (than found in Dr. Fuhrman's book) is also located at the same site. I'll be making this recipe and posting my own adapted version as an attachment in the near future. If anyone else has made it, please post your comments or reviews so we can all learn from your experience.